Contrary to public perceptions that he wont appear before the justice Bola Ajibola Judicial Commission of Inquiry into last November civil unrest in parts of Jos North council area of Plateau state, former military President, Ibrahim Babangida made a surprised appearance to respond to “facts made against” him by witnesses. Also on hand to respond to same issues was the Media Trust, publishers of Daily Trust newspapers, which also pledged to stand in for its columnist, Mallam Haruna Mohammed, that was on the list of invitees. 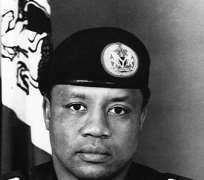 Announcing appearance for Gen. Babangida was his legal counsel, Mohamed Ndayako who said the former ruler has agreed to appear and respond to the facts against him, but added that the commission, in its invitation, could not include details of the contenss of witnesses allegations to enable them respond to them accordingly. As a result, he appealed to the commission to give a fresh date within which they are expected to study and made themselves available, and suggested next Tuesday, which, was after due consultations with the commission senior counsel, Charles Obisha and Prince Ajibola, it was granted. In the same vein, the representative of Daily Trust and also the company secretary, Ebeya Abba, appealed for same time because the details were omitted when the company and the columnist was invited. Meanwhile, former deputy senate president, Ibrahim Mantu, the ANPP candidate for Jos North in last November election, Alhaji Aminu Baba, a renown politician, Alhaji Sale Hassan and a Hausa Chieftain in Jos, Alhaji Inuwa Ali shun their invitations to appear before the commission. At least 11 individuals and organizations, billed to appear before the commission on Tuesday as those invited to appear before it to respond to similar issues raised against them are among the 110 invitees being awaited. However, the commission chairman has disclosed that the doors of the commission would be shut against those that have not been able to present their memorandum, after several invitations to them to do so in view of time constraints. So far, out of 220 memorandums that were received initially, only 14 are still pending. Also the Commission, has berated the Human Rights Watch over its report on the crisis. “I am personally disappointed in you, your findings are very shameful, that is very disturbing and that's all,” a visibly angry Ajibola told Eric, the Human Rights Watch Researcher in Nigeria . He expressed disappointment that, the Human Rights Watch Researcher could not tell the Commission where the crises started from, when it started and who were the people who started it. The Commission's Chairman lamented that, Eric did not make any attempt to investigate all these as a researcher saying, he was not in a position to tell the Commission anything. Ajibola, therefore, posited that, the memorandum of Human Rights Watch could not be relied upon by the Commission and querried what he had been investigating about the crisis. Eric had told the Commission how uniformed men allegedly killed 118 Hausa-Fulanis on November 29, 2008 following an alleged shoot-at-sight order by Governor Jonah Jang. He had also alleged that, the crisis resulted from discrimination against the Hausa-Fulanis who could not trace their ancestral roots to where they presently were. The Human Right Watch Researcher, therefore, urged the Federal Government to promptly pass legislation to stop the discriminatory practices saying, the nation's constitution recognised equal protection for all Nigerians. He also urged the Commission and relevant stakeholders to ensure its findings and those of previous Commissions into Jos Crisis were made public and implemented. However, upon interrogation by the Commission's Counsel, Barr. Charles Obishai, the Human Rights Watch confessed that, he was not in Nigeria when the crisis broke out on November 28. Eric disclosed to the Commission that, he arrived the country on December 3, 2008, five days after the crisis had started. He explained that, he was told that, uniformed men using government vehicles allegedly killed the 128 Hausa-Fulanis adding the Chief Imam of Jos Central Mosque gave him the deceased lists. According to him, however, the Assistant Commissioner of Police in Plateau and the Military High Command denied arbitrary killing by their men but that, he formed his opinion based on what the victims told him. At this point, the Commisison's Counsel affirmed to Eric: “You were procured to do the job, you were paid by some people to do what you do,” which Eric denied.